After the elections for the European Parliament on 22nd-25th May 2014 what future lies ahead for the Europeans? What are the European Union's prospects? Whilst at the height of the euro crisis some forecast the disappearance of the single European currency, and even quite simply the collapse of Europe, what do things look like now just as the end of the crisis now seems to be turning into a reality? Europeans are particularly concerned about the future. A great majority of them believe that the lives of the young generation will be more difficult than theirs has been. Europe must therefore prepare to rise to the major challenges of tomorrow. How? - by promoting all of its existing assets and especially by improving its weak points. Several things might influence the way Europeans see the future positively: improvements in the economic situation first and foremost, also changes that are due to be made to the European institutions in the follow-up to the last election. "No future", declared the punk movement at the end of the 70's. That was nearly 40 years ago, a few years after the oil crisis, which the beginning of the end of the post-war boom and full employment. But what now? What future is there for the European Union and the Europeans? What place is there for the European Union in the globalised world as it faces the competition of major economic powers and increasingly that of the emerging countries, with their staggering growth rates, unbeatable labour costs and "soft" social and environmental standards, to say the least? Let us quote a date first of all: as of 2040 the European population will start to decline. In 2015 already the number of deaths is due to be higher than that of births and immigration would therefore have to guarantee demographic progression in the European Union. In 2060 nearly one third of the European population will be over 65. The effects of this phenomenon on economic life will be manifold: ageing of the work force, challenges made to the retirement system, changes in consumer habits - a series of factors that are naturally a source of concern. In this context, and even if the European Union seems to be emerging gradually from the economic crisis, Europeans seem to find it hard to foresee the future with serenity. Recent Eurobarometer surveys provide us with precise details about how the population sees the future of the European Union. They show quite clearly that anxiety dominates when people look to the future. Europeans notably believe that the young generation will have a harder life than they have had. They also believe that the European Union will have less influence than the world's major powers, in other words China and the USA. What is the main reason for this pessimism about the future? Obviously the economy, and especially employment which is seen to be the main challenge. What should be changed so that we face the future with greater confidence? The European Union has a certain number of assets which it can build upon. European society must also focus on certain areas in order to be better prepared for tomorrow's challenges. Finally a major share of Europeans seem to think that more decisions should be taken at European level, notably in areas they deem to be key for the future. There are reasons to be optimistic, notably at the beginning of the summer 2014: the economic situation is improving and it seems increasingly that a the crisis is now really coming to an end. 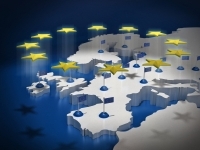 Moreover the results of the most recent European elections will lead to a certain number of changes in the European institutions notably in the Parliament and the European Commission. This will provide European integration with new impetus. In addition to this the emergence of a new generation of politicians may help to reconcile Europe's citizens with the European project. For a long time people felt that life would be easier for their children due to technological and medical progress, economic growth and social improvements. But that is now in the past. The crisis has cast a shadow and the feeling has now reversed: an absolute majority of Europeans think that their children's lives will be more difficult than theirs has been (56%, against 22% who think the contrary to "it will be easier"). This is what most people think in 21 Member States, the champions of pessimism being, as is too often the case, the French with only 10% saying life will be "easier". At the other end of the scale hope is highest in Portugal where most of those interviewed hope that life will be better for their children than it has been for them. The feeling also varies according to socio-demographic categories with the highest differences according to age. As is often the case with questions about the future young people are much less pessimistic than those who are older: although 59-60% of those over 40 think that life will be more difficult for their children, only 44% of the 15-24 year olds share this opinion. In spite of these differences pessimism dominates most categories of the European population. What will the European Union's voice be in 2020? Beyond the European population's concern about the future of its young people, another source of concern comes to the fore: that of the voice that the European Union will have in the world arena. When questioned about the European Union's global voice in 2020 Europeans are indeed divided: although they think that the EU's global influence will be greater than that of Brazil (59% believe that it will be greaterer against 23% who think the opposite) and India (56% against 28%), and even that of Russia (47% against 35%), Europeans are more divided about Japan (44% against 41%). However in the face of two giants like China and the USA, it is pessimism which dominates. More than half of European citizens believe that Europe's global influence will be weaker than that of China (56% "weaker", against 32%), or the USA (52% against 34%). It seems that the link between the perception of global influence and economic power is extremely strong. Indeed when asked to say which country will be the leading economic power in 2025, Europeans first quote China ahead of the USA. The European Union comes third, far behind, but it precedes Japan, Russia, India and Brazil. We find exactly the same ranking as for the previous question: Europeans think that the EU will be behind China and the USA but ahead of Japan, Russia, India and Brazil. Uncertainty about the influence held by the EU in the future seem to be closely linked to that about Europe's economic situation in comparison with that of other major powers. Doubt about the diplomatic role played by Europe in the future is even clearer when Europeans are asked directly whether they think that in 2030 the EU will be one of the world's main diplomatic powers: 45% of them think this against 40% who think the opposite and that this will probably not be the case. Quite often this division in opinion across Europe hides major differences between countries: hence in 14 Member States the feeling that the EU will be a true diplomatic power prevails, with the highest shares being achieved in Denmark and Sweden (64% in both countries). The opposite is true in 12 Member States with the highest level of doubt being in Slovenia (71% "no, probably not") and in the Czech Republic (69%). The European Union's main challenge? The economy stupid! There is no need to look hard for an explanation to this pessimism about the future of young people and Europe's influence in the world: "it's the unemployment, stupid!" An examination of the main challenges facing the EU leads to an understanding of this anxiety about the future. Unemployment is by far the main challenge facing the EU: quoted by more than half of the Europeans (53%), it is clearly ahead of other possible choices like social inequality (32%), Member States' government debt (29%) and inadequate economic growth (22%). Europeans believe that the four main challenges facing the EU are directly linked to the economy. Germany, where the issue of Member States' government debt comes out ahead and Estonia, where those interviewed quote the ageing population first of all, stand out from the rest: these are the only two countries in which unemployment is not deemed to be a major challenge. Everywhere else unemployment is deemed as THE main challenge reaching totals of 78% in Cyprus, 68% in Poland and 67% in Spain. Concern about unemployment, and more generally the economy are weighing down on European morale. People are concerned about the future of the young generation and also about Europe's place in the tomorrow's world. Fear of losing rank is not just individual but it also seems to be collective. 2. HOW CAN WE BEST PREPARE FOR THE FUTURE? By capitalising on existing assets? How should the EU prepare itself for tomorrow's challenges? Can it capitalise on its main assets? And what are these incidentally? In spite of the concern described earlier, the EU's economic, industrial and trade power, is Europe's leading asset in the eyes of its citizens (33%), just ahead of the respect of democracy, human rights and the rule of law (31%). The lead position granted to the EU's economic, industrial and trading power might seem somewhat contradictory in the light of the prevailing economic theme in the ranking of main challenges. But this is not the case. Europeans know that the EU's economic, industrial and trade assets are real. Their concern comes from a feeling that the European economy is losing ground on a daily basis to the competition of the heavyweights in the world economy (China and the USA), and also to the emerging powers (India, Brazil, South Africa, Indonesia and Mexico etc .). Ranking third and fourth as the EU's main assets, Europeans place the good relations between Member States (25%), and citizens living standards (24%): these are two major dimensions but which are not really a guarantee of security in terms of addressing future challenges in a globalised, increasingly competitive world. The skills and talents of European citizens and the EU's capacity for research and innovation would undoubtedly enable a more confident approach to the future but these dimensions are quoted by a minority of Europeans (11% and 10% respectively). Finally we observe that a significant share of Europeans respond spontaneously that the European Union has no assets. Unsurprisingly it is in the States most affected by the crisis that this feeling is the most acute: in Greece (29%, where this is the first response given, far ahead of all other answers put forward), as well as in Portugal, Slovenia and Spain (18% in each of these countries). In 10 Member States this share totals 10% and over. In conclusion European citizens acknowledge that the EU has a certain number of assets. However those which might give them the feeling that they are well prepared for the future like for example research and innovation are only quoted last. From a strategic point of view how can strength be gathered and better preparations made to address the future with a maximum number of assets? By maintaining the strong points and especially by improving and development the weak points; this is true in many areas and it also applies to the European Union. This is what seems to emerge from the answers given by Europeans when they are asked how European society should rise to future challenges. They firstly quote social equality and solidarity which clearly take the lead over all other suggestions with 49% (+6% since November and December 2012), ahead of progress and innovation (34%, -3). Europeans therefore want society to focus on areas they believe to be the EU's weaknesses: indeed social inequalities are seen to one of the main challenges (second after unemployment), whilst progress and innovation only come at last in terms of European assets. In third position Europeans quote the protection of the environment (31%, -1), ahead of free-trade and the market economy (28%, -2). Cultural diversity and opening to others as well as traditions are not quoted as much. Giving more power to the European Union? Having identified a certain number of points on which to focus in order to rise to future challenges, it is now a question finding what the best way forward might be. In particular what type of action would be the best: national or European? Europeans seem to lean towards the second option and want the EU to take more decisions notably in terms of protecting the environment (72%, against 22% for less decisions) and of countering unemployment (62%, against 34%). We should recall that they believe that European society should focus on protecting the environment in order to rise to the main world challenges, and that unemployment is THE main challenge: therefore it is over these major issues that they want the EU to have more decision-making power. A great majority of Europeans also believe that more decisions should be taken on a European level regarding "immigration issues" (59% against 34%). European public opinion is more divided regarding "healthcare and social security" (50% against 43%) and "economic policy and taxation" (48% against 44%). This seems to show that some Europeans deem European policy to be a lever to use so that the EU is better prepared to face the main global challenges. The most recent Eurobarometer surveys reveal a real improvement in terms of the way the economic situation is viewed. The assessment of the national and European economic situations, just like short term development prospects, have improved. Although they are mainly negative the downward trend which has typified these indicators over the last few years finally seem to have turned around and this might be for the long term. The recovery that was announced on many occasions seems to be here at last, even though it is somewhat hesitant for the time being. One indicator will come under particular scrutiny over the next few months: the unemployment curve which has been rising almost constantly since 2007. If it turned for good everyone's state of mind in Europe would improve. This might also then trigger off the celebrated virtuous circle: confidence => recovery in consumption and investments => growth => reduction in unemployment => confidence. This would be enough to see the future in more positive light. The European elections of May 2014 might have a positive effect on European confidence in the future. Firstly, because it is undoubtedly a moment when the distance, sometimes seen as being infinitely large, between the citizens and the European institutions, is the smallest. All citizens were called to ballot to elect their MEPs and European issues occupied the media for some weeks. A direct consequence of this is that it is also a moment when the feeling that Europeans are being taken into consideration by the European Union moves forward. But this feeling is closely linked to confidence in the future, which will quite probably rise in the next opinion polls. After the European elections, will Europe be more political? Most Europeans want more decisions to be taken on a European level, in areas ranging from the protection of the environment, the fight to counter unemployment and questions regarding immigration. For the first time Europeans took part indirectly in the appointment of the President of the European Commission via their vote in the European elections. The new President will logically have greater democratic legitimacy which will certainly have a positive effect on all of the European institutions and their decisions. Enhanced legitimacy might also facilitate a move towards a more political European Union, simply because in the end the main guidelines set by the Commission will be a result of the citizens' vote. New personalities - new politics? Beyond the theoretical aspects, politics is also a question of people and personalities. This European election will clearly herald a major change from this point of view. Rightly or wrongly the President of the European Commission, José Manuel Barroso and the EU's High Representative for Foreign Affairs and Security Policy, Catherine Ashton have sometimes been severely criticised during their term in office. Whoever the people are who take over from them, we can just hope that they will bring new impetus to the European project. Moreover new political personalities have entered the European stage: Ska Keller, the Green co-candidate, Alexis Tsipras, of the European United Left and Matteo Renzi, the President of the Italian Council, put forward as one of the main winners in this European election (with 40.8% of the vote, the Italian Democratic Party won the election in Italy). Young and talented, committed to European issues, this new generation of men and women may revive people's taste for Europe and bring confidence back to the European project. This will enable the European Union and its citizens to address the future in the best manner possible. An ageing population, an economy under the threat of new emerging powers, Member States downgraded by ratings agencies in the wake of the debt crisis, increasing inequality between European citizens and continuously rising unemployment - in this worrying context it is difficult for Europeans to be optimistic and imagine what the future holds. Many feel that the young generation will have a harder life than they have had, a feeling that goes against the very idea of progress. Moreover they fear that Europe's voice will be smothered by that of the USA and China, the other major economic powers. The anxiety of Europe and its citizens losing rank can be explained by the order of the main challenges they face, which is dominated by economic issues. Can Europe use its assets as a support to prepare for the future? Only in part. Because although the EU's economic, industrial and trade power is seen as its main asset at present, it does not stand out clearly from the other suggestions put forward. However what might strengthen the EU's ability to face future challenges, i.e. the skills and talent of European citizens and the EU's capacity in terms of research and innovation, feature far down the list of assets quoted. Logically it is what Europeans see as the EU's weaknesses that emphasis should be placed in order to rise to the main global challenges: social equality, threatened by unemployment that is increasing inequality between Europeans, and also progress and innovation appear to be the weak points. To do this some of them want Europe to have more decision-making powers. Although on first sight European prospects do not seem very optimistic Europeans do not seemed to be resigned however: they have identified the points on which European society has to concentrate to be better prepared for tomorrow's challenges; a major share of them want to give the EU more means to succeed in this. And now the time is ripe: the European economy is reviving at last and undeniably this will affect European morale positively. Moreover the European elections last May might boost this. Involving citizens in the process to appoint the President of the European Commission was a first step towards reconciling the Europeans with their institutions. The people who will take up the main positions in the institutions, President of the European Commission, the EU's High Representative for Foreign Affairs, the President of the European Council, can provide new impetus to European integration by setting a more political tone. In any event this seems to be what some citizens want, as they ask for more decisions to be taken on a European level and this might undoubtedly brighten their views of the future. To do this it is therefore vital for the institutions to respect the vote made by the citizens of Europe and choose the candidate who won the elections as the next President of the European Commission: Jean-Claude Juncker, the EPP's candidate. A U-turn and the appointment of another candidate might appear to be a true denial of democracy: this would then send out a disastrous message to all European citizens. We should note that this question was asked before the Crimean crisis and the conflict in the east of Ukraine. During the American presidential electoral campaign in 1992, "the economy, stupid", was one of the leading slogans in Bill Clinton's campaign.